Most of us are all too familiar with the atrocities of the Holocaust. Most of us cannot let our minds and hearts forget the unbelievable destruction of Japan and it’s people as a result of America unleashing the atomic bomb. 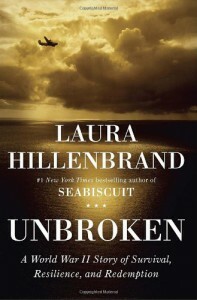 In Unbroken, Laura Hillenbrand has focused her research and her unique narrative voice to tell us the true story of Louis Zamperini, an American bombardier, whose plane crashed during a search mission over the Pacific. What follows then is an unforgettable, chilling and extraordinary story of survival, resilience and redemption. I know, I know…..these are the same words that appear on the very cover of the book itself. In my defence all I can say is that this really is a testament to man's ability to survive when driven to the absolute limits of endurance and beyond. Hillenbrand's writing is extraordinary. She brings this story to life, letting it unfold over the reader's eyes with a clarity that is nigh on cinematic. You really must see this for yourselves. This is not a book one reads, rather an experience one will never forget.